Camille Pissarro, one of the creators of the impressionist style, was the only impressionist to participate in each of the eight group exhibitions. He sent five paintings to the first show in 1874. Its modest scale and simple subject notwithstanding, Orchard in Bloom, Louveciennes headed the list of Pissarro's works in the catalogue, perhaps for personal associations. Fleeing with his family to London during the Franco-Prussian War, the artist waited until late 1871, after the suppression of the Commune, to return to his home in Louveciennes. His house had been occupied and many of the paintings he had left behind had been destroyed. As France began to rebuild, the artist also gradually recovered from the disaster. 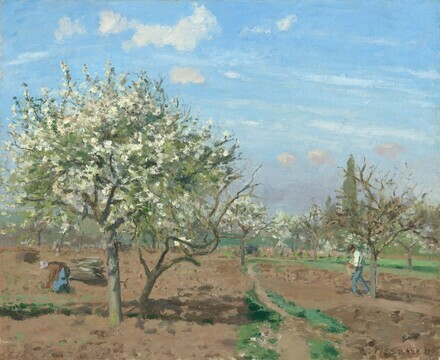 In Orchard in Bloom, Louveciennes, painted the next spring, abundant white blossoms and freshly plowed soil are tokens of hope and renewal. Early in his career Pissarro designated himself a pupil of Corot, and in this 1872 painting Pissarro's broad method of composing and choice of a tranquil rural setting inhabited by a few small peasant figures still recall the older artist. Pissarro was able to sell the painting in July 1872, soon after its completion. It was bought by a new and important patron, Paul Durand-Ruel, one of the earliest impressionist purchases by the dealer remembered for his courageous and sustained support of the avant-garde artists. Acquired from the artist in 1872 by (Durand-Ruel, Paris); sold between 1882 and 1888. Alfred Bernheim, Paris, by 1936. Purchased 1946 by (Alex Reid & Lefèvre, London); sold 14 March 1950 to Lady Baillie. (Arthur Tooth and Sons, London); sold June 1959 to (Sam Salz Inc., New York); sold 26 April 1960 to Ailsa Mellon Bruce [1901-1969], New York; bequest 1970 to NGA. See letter dated 20 December 1977 from Charles Durand-Ruel, in NGA curatorial files. Lent by Alfred Bernheim to the 1936 Paris exhibition. Provenance between Alex Reid & Lefèvre and Arthur Tooth and Sons per Joachim Pissarro and Claire Durand-Ruel Snollaerts, Pissarro: Critical Catalogue of Paintings, vol. II, no. 248. Dated receipt from Salz to Mrs. Bruce in NGA curatorial files. Première Exposition, Société Anonyme des Artistes Peintres, Sculptuers, Graveurs, etc. [First Impressionist Exhibition], Paris, 1874, no. 14, as Le verger. Les premières époques de Camille Pissarro, de 1858 à 1884, Galerie Marcel Bernheim, 1936, no. 13, as Berger [sic] à Louveciennes. Capolavori Impressionisti dei Musei Americani, Museo e Gallerie Nazionali di Capodimonte, Naples; Pinacoteca di Brera, Milan, 1986-1987, no. 35, repro. The New Painting: Impressionism 1874-1886, National Gallery of Art, Washington, and The Fine Arts Museums of San Francisco, 1986, no. 14, repro. Französische Impressionisten und ihre Wegbereiter aus der National Gallery of Art, Washington und dem Cincinnati Art Museum, Neue Pinakothek, Munich, 1990, no. 40, repro. Paris in 1874: The Year of Impressionism, National Museum of Western Art, Tokyo, 1994, no. 38, repro., as Le Verger. Camille Pissarro, Civiche Gallerie d'Arte Moderna e Contemporanea di Ferrara, Palazzo dei Diamanti, Ferrara, 1998, no. 13, repro. Pissarro: Creating the Impressionist Landscape, The Baltimore Museum of Art; Milwaukee Art Museum; Memphis Brooks Museum of Art, 2007-2008, no. 27, repro. Impressionist and Post-Impressionist Masterpieces from the National Gallery of Art, The Museum of Fine Arts, Houston; The National Art Center, Tokyo; Kyoto Municipal Museum of Art, 2011, no. 38, repro. Intimate Impressionism from the National Gallery of Art, Museo dell'Ara Pacis Augustae, Rome (exhibition title in this venue: Impressionist Gems); Fine Arts Museums of San Francisco; McNay Art Museum, San Antonio; Mitsubishi Ichigokan Museum, Tokyo, Seattle Art Museum, 2013-2015. Pissarro, Ludovic and Lionello Venturi. Camille Pissarro, son art, son oeuvre. 2 vols. Paris, 1939:1:100, no. 153, as Verger en Fleurs, Louveciennes; 2:pl. 31. Goldwater, Robert. "The Glory that was France." Art News 65 (March 1966):86. Rewald, John. The History of Impressionism. New York, 1973:297, repro. Rewald, John. "The Impressionist Brush." Metropolitan Museum of Art Bulletin XXXII. no. 3 (1973/1974):24, repro. European Paintings: An Illustrated Summary Catalogue. National Gallery of Art, Washington, 1975: 270, repro. Small French Paintings from the Bequest of Ailsa Mellon Bruce. Exh. cat. National Gallery of Art, Washington, D.C., 1978: 18, repro. (continuing exhibition beginning in 1978). Walker, John. National Gallery of Art, Washington. Rev. ed. New York, 1984: 508, no. 758, color repro. European Paintings: An Illustrated Catalogue. National Gallery of Art, Washington, 1985: 314, repro. Französische Impressionisten und ihre Wegbereiter aus der National Gallery of Art, Washington und dem Cincinnati Art Museum, Exh. cat. Neue Pinakothek, Munich, 1990: no. 40, repro. Coman, Florence E. Joie de Vivre: French Paintings from the National Gallery of Art. Washington, 1991: no. 7, repro. National Gallery of Art, Washington. National Gallery of Art, Washington, 1992: 189, repro. Kelder, Diane. The Great Book of French Impressionism, 1997, no. 128, repro. Southgate, M. Therese. The Art of JAMA: One Hundred Covers and Essays from The Journal of the American Medical Association. St. Louis, 1997: 88-89, 204, color repro. Pissarro, Joachim and Claire Durand-Ruel Snollaerts, Pissarro: Critical Catalogue of the Paintings, 3 vols., Milan, Paris and New York, 2005: II:248, repro.